Welcome to Emergency Dentists USA is here to help you find just the right emergency dentist in San Bernardino should you have a dental emergency. Emergency Dentists USA has compiled a comprehensive list of emergency after hour dentists so that you can find the help you need during the time that you need it. When you call our hotline, our knowledgeable operator will help you find the right emergency dentist without the hassle of searching the internet. 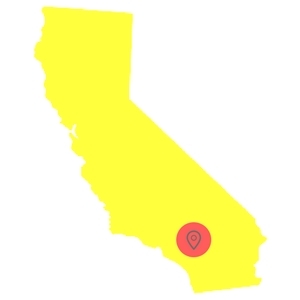 Our information makes it easy for you to pick out a quality emergency dentist and get back to enjoying your stay in San Bernardino. Emergency Dentists USA helped me so much when I had an extremely painful toothache, which of course I got on a holiday weekend. I thought I’d have to wait until Tuesday when offices were open again, but I was so lucky to find this site and the staff were able to find a dentist who could help me! Finding an emergency dentist in San Bernardino, CA does not have to cause you a headache there are a variety of options available at your fingertips. After hour dentists in San Bernardino are plentiful. The Hospitality Dental Group of San Bernardino is an after-hours clinic that stays open late Monday through Thursday until 7:30 pm. Western Dental is open late Monday through Friday until 7 pm. They also have office hours until 4:30 pm on Saturday. Dental Care San Bernardino has office hours until 7 pm on Tuesday and Wednesday and 6 pm on Thursday. California Bright Dental is open late Monday through Friday until 6:30 pm and they have office hours for your Saturday dental needs until 3 pm. Finally, My Dentist dental clinic has late office hours Monday through Thursday until 6 pm and they have appointments available on Saturday until 2 pm. Emergency Dentists USA is the best source for finding excellent emergency dentists in the San Bernardino area. There are a large variety of dental clinics available in the area. Our 24-hour emergency helpline at Emergency Dentists USA is there to link you to a live operator to help you find the proper emergency dentist to meet your dental emergency. Description: If you encounter severe dental pain while on the road, the best thing to do is call our easy to use 1-800 number to find the perfect emergency dentist for you. Description: Western Dental is a San Bernardino clinic that can help you with dental needs ranging from abscessed teeth to wisdom teeth coming in incorrectly. If you are experiencing intense dental pain, it is very important to see the dentist right away so any infection does not get worse. You can visit the staff here on Saturdays from 8 AM until to 4:30 PM, which is ideal if you are a student or full-time worker during the week. Description: California Bright Dental is a San Bernardino Clinic that stays open during Saturdays to make sure that everyone who is in need of an appointment can be seen promptly. You can even get an appointment here on Saturdays from 9:30 AM until 3 PM, which is great for those who have busy lives and jam-packed schedules during the week. It can be anything from a severely aching tooth to wisdom teeth coming in improperly: the staff here has always got you covered. Description: You may have the need for an extraction, root canal therapy, or just have an aching tooth that needs to be looked at; the staff here can help you with all of these. Don’t put off going to the dentist, and see the staff at My Dentist for intense pain today. Description: The staff is known for their extreme care, level of expertise, and awesome bedside manner. If you are experiencing anything from severe dental pain to issues such as an injured jaw or cracked tooth, this is the staff that will be able to set you straight and devise a plan for your overall dental health. Description: Dental Care San Bernardino has a great staff that has been known to give the best level of care for anyone needing dental help. At this time, the clinic stays open late until 7 PM on Tuesdays and Thursdays. Known to be compassionate, experienced, and some of the most skilled in the state, the staff here will be able to quickly diagnose, care for, and provide a game plan for your pain-free dental health. When you are preparing for your appointment, have all your paperwork, dental records, and insurance information ready for your appointment. Make sure to bring your ID, insurance card and any necessary medical documents such as past dental x-rays. Plan to arrive at least 15 minutes early to your appointment. This extra time gives you an opportunity to fill out any paperwork that might be needed for your visit to your San Bernardino emergency dentist. Talk to your dentist about accepted payment options. Find out before you go if they bill your insurance for you. Also, determine if they accept the payment method that you are planning to use. Let your emergency dentist know if you have any allergies. Whether you have a chipped tooth, an abscess, or an issue with your braces, your San Bernardino emergency dentist can handle your emergency for you in a timely manner. These types of emergencies are scary experiences that require prompt treatment, and our dentists are there to handle your situation in a fast manner for you. 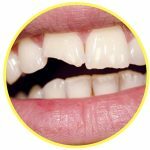 A broken or chipped tooth is a common dental emergency that people experience. Find the broken piece of tooth, if possible, and rinse it off using water. Place it in a container of milk or water with a touch of table salt. Bring the container to your San Bernardino emergency dentist. If your mouth is bleeding, place a piece of gauze on the wound and apply pressure for 10 to 15 minutes. A cold compress to the outside of your mouth where the wound is can help with pain or swelling. Contact your San Bernardino emergency dentist immediately. If your damaged tooth is from a fall or accident that hurt more than just your tooth, a trip to the ER may be in order to check for further injuries. A knocked-out tooth is a frightening experience. Do not panic, retrieve the tooth, grasping it by the crown. Rinse off the tooth if it is dirty, being careful to not scrub it or remove any attached tissue. Carefully try to place the tooth back into the socket. Do not try to force it back in the socket and be sure that it is facing the right direction. If you can not get it back into place, put it in a small container of milk or water with a touch of salt. Call your San Bernardino emergency dentist as soon as possible because a tooth returned to the socket within the hour has the best chance of being saved. Whether you were skiing and fell and hit your tooth or you are in a car accident, tooth trauma caused by an accident is a scary experience. Your first step would be to see an emergency room physician to evaluate whether you need medical assistance other than just dental care. Once that is complete, contact your San Bernardino emergency dentist to have them examine and x-ray your teeth to see what steps to take next in your emergency dental treatment. There are a number of reasons that you might need an emergency tooth extraction, including a tooth damaged by decay, damage from an accident, or from an infection. It is best to never delay in getting your tooth removed should it need to be extracted, as leaving it could cause more complications and further pain. Your San Bernardino emergency dentist will evaluate your situation and determine the best course of action depending upon your individual need. The dentist will first do an exam and an x-ray. Once they know exactly what is going on, they will numb the area with a local anesthetic. Once the tooth is numbed, the dentist will remove the tooth using their dental tools. The tooth will either be pulled out whole or broken depending upon the case. 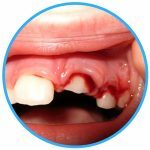 Once the tooth is removed, a piece of gauze is placed over the hole to control the bleeding. It takes about two weeks for the area to heal. Completely follow any instructions that your dentist gives you in regards to aftercare, as you do not want complications from the extraction. They may prescribe you antibiotics and/or pain medication. Your San Bernardino emergency dentist is there to help you during whatever your dental emergency might be. An emergency dentist is specially trained to handle all dental emergencies and they are the best choice when it comes to your dental emergencies. A car accident, a slip and fall, or a sports injury are emergencies where you should first visit the hospital emergency room. The emergency room is not able to treat most dental emergencies, but they can scan for broken bones or any other injuries that might be there. The emergency physician can prescribe you the necessary medication and then refer you to a San Bernardino emergency dentist to make the necessary repairs to your teeth. Dental emergencies such as lost crowns or fillings or broken braces should be left to the emergency dentists. Remember when you select a San Bernardino emergency dentist to always check out their dental credentials with local, state, and city dental associations. The American Dental Association website has information on their website. The California Dental Association also have information on their site in regards to local dentists and their credentials.